After 20 years in this industry, I can easily say I’ve taken enough classes to earn a doctorate. So it must have been an act of providence that I was fortuitous enough to have met Lauren Gartland and the team from Inspiring Champions. Never have I received the What, Why and most importantly How to running and driving my business forward. There are countless situations in which documents are essential to the day-to-day operations of a Salon and Day Spa business. Gain the expertise to plan, develop and put in place a complete human resources infrastructure to run your business. We walk you through the process of developing and implementing policies and procedures, provide you with templates you customize for your business all with one affordable solution. 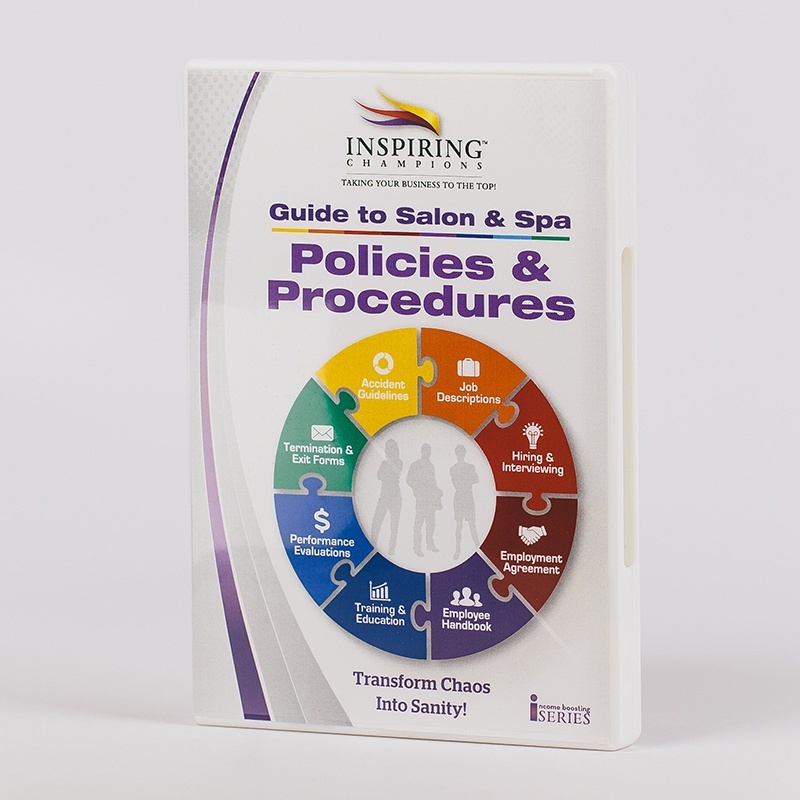 Complete Salon and Spa Policy & Procedure Handbook (workbook and CD). Job Descriptions for Aestheticians, Front Desk, Hair Designers, Massage Therapists & Nail Technicians. Accident Investigation Form & Accident Reporting Guidelines. Employee Termination Notice & Employee Exit Form. Employee Training & Education Agreement. Interview Procedure including Employee Application Form.